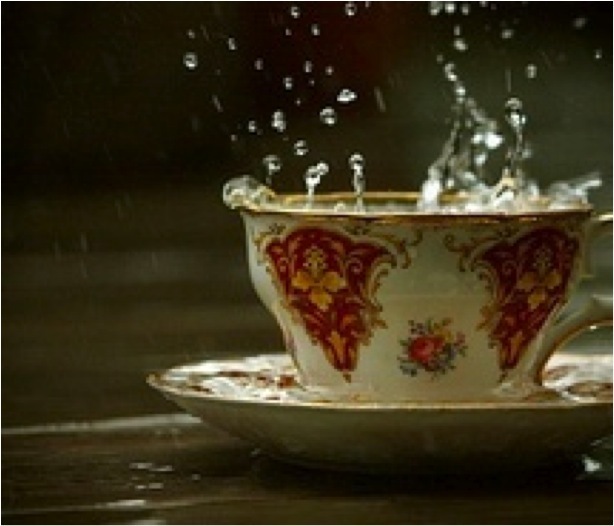 “Capturing Rain in a Teacup?” What does it mean to be spiritual but not religious? To you, does it seem trendy? Does it have any meaning at all? Is it sacrilegious? I recently heard a conversation between Krista Tippett and author Pico Iyer as they discussed these questions. Tippett said that she had once heard Iyer use a metaphor calling spirituality water, and religion tea. She then offered her own version of the illustration. She suggested that spirituality is as water but religion as a cup, the vessel that allows us to draw spirituality unto ourselves, and to offer it to others. She added that the cup also confines it, and that the vessel is often imperfect; that it is sometimes dropped and broken, making it dangerous and incapable of holding any water at all. Later, I was sharing this conversation with my family as we sat on my parents’ screened-in lanai off of their home near the Gulf Coast in Florida. As we talked, the rains came. First in a few drops, and then in an utter deluge. From the lanai, we can see the lake. The rain caused the lake’s surface to dance and sparkle. Its life became apparent in new and dynamic ways. As I watched, it occurred to me that there is another weakness embodied by the cup—by religion. It presents spirituality only to parts of our body and our existence—not to our wholeness. In that downpour of rain, a cup seemed so trivial, so small—and so silly. I excused myself from the lanai, and stepped out into the rain. I allowed it to drench me. Head-to-toe I became immersed in the glorious water from the heavens. Before coming to Florida last week, I had divided my time between San Diego and Uganda for years. California is in the midst of a drought, and most of my recent stays in Uganda have been during the dry season—meaning that I have experienced very little rain in a long time. But here, the free and abundant gift of Florida’s summer rain—which falls every day—is truly marvelous. I love feeling it as it falls directly onto my skin—or as it makes heavy the air around me on the lanai. I love the fragrance—before, during—and after the rain. I love how it makes the landscape green and abundant. And fertile. And while I also enjoy and appreciate a nice cup of tea, and while I shall continue to savor my own, I shall be oh-so careful not to allow the cup to become the focus of my being. Lest I miss the rain—and the whole blessed point of it all. When I think of the difference between religion and spirituality, I think of a book I was fortunate enough to read when I was in middle school that included the writings of Frank Laubach and brother Lawrence titled, “Practicing His Presence”. Although beautiful, religion sometimes seems formal and ritualistic to me i.e. Lent, Advent, Yom Kippur, Ash Wednesday, Nirvana Day, Diwali etc. Church services and formal ceremonies are often confined to specific behaviors and times but “being spiritual”, on the other hand, can happen on a constant basis. Knowing that the focus of these types of ceremonies are to guide someone to a spiritual connection with their God, I believe religion serves the very important purpose of guiding us to the ultimate beauty of living a “spiritual” life, where we experience the presence of God on a daily basis. When I read about how brother Lawrence practiced God’s presence by talking to him while washing dishes every day in a monastery, I realized for the first time the importance of relationship over practicing a religion. After reading this book I decided to adopt this same behavior and soon discovered that the faith I had been practicing by following a protocol quickly developed into a personal, meaningful, passionate and intimate relationship! I sometimes tell friends that during this time, the God I served, changed from “my father” to “my daddy”. I have faced overwhelming loss in my life since the time I read this book and I honestly believe that reading it was a major part of God’s plan for me because it prepared me to rely on him during those times of suffering. I am incredibly grateful for the peace and safety I’ve experienced through practicing his presence because it helped me realize that I’m never really alone. Because of this realization there never have to be any “set confession times” (i.e. bedtime prayers or set morning devotionals), in my life now and there are never really any “amens” because the conversation I’m having with God doesn’t end until I fall asleep. The daily fellowship I have with him can be as close, intimate, and constant as the relationships I have with those in my innermost circle that I can physically see. These constant conversations, allow for continual confession and communion all day every day. God is right there with me and I’m talking to him while I’m driving and while I’m cleaning the house and going to work or school etc. When I read his word it is because I have a free moment to do it and because I want to have a quiet time to just focus on him and not because my alarm went off telling me it’s time for devotions and I feel obligated. Instead of devotionals they are more like “breaks” I take with him similar to the lunch break I was able to take with my son yesterday (that I enjoyed immensely), after working together in the yard all morning. When I’m making bad choices or losing my temper or having a selfish moment, he’s grieved, but he is still right there with me and by practicing his presence I am immediately reminded at that moment, to make things right with him (on a moment by moment basis), instead of a “confession time” at the end of the day when I’m tired and can’t remember the long list of my mistakes…and yes I make more than I can remember or keep up with on a daily basis. I believe being spiritual allows a person to have a deeper intimate relationship with God by communing with him through the ordinary experiences in life and not just the occasional formal ones like weekly bible study, Sunday services or holidays. That belief can be compared with the saying about parenting, “you can’t have quality time without quantity time”. In other words teachable or “quality” moments with our children (such as the lunch I had with my son yesterday), come when we spend large amounts of time together, (like working in the yard all day together). So to me..I guess the practice of religion is the first step toward an intimate relationship with God… and practicing his presence daily will lead to a life that is spiritual which is the ultimate goal for me.